After leaving her home in the western Canadian fishing village of Tofino to spend the summer in Alaska studying humpback whales, Kitty finds herself caught up in an unforgettable adventure involving stolen gold, devious criminals, ghostly shipwrecks, and bone-chilling curses. Kitty's adventure begins with the lingering mystery of a sunken ship called the Clara Nevada. As the plot continues to unfold, this spirited story will have readers anxiously following every twist and turn as they are swept along through the history of the Klondike Gold Rush to a suspenseful final climatic chase across the rugged terrain of Canada's Yukon. 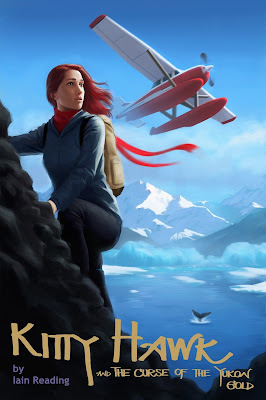 There are currently five books in the Kitty Hawk Flying Detective Agency Series: Kitty Hawk and the Curse of the Yukon Gold (book 1), Kitty Hawk and the Hunt for Hemingway's Ghost (book 2), Kitty Hawk and the Icelandic Intrigue (book 3), and Kitty Hawk and the Tragedy of the RMS Titanic (book 4), and Kitty Hawk and the Mystery of the Masterpieces (book 5). Each book can be read as a standalone.